I'm back! As you can see (the date), it is clearly shown that I wasn't able to update my blog for quite some time. I feel wronged for not being able to become an active fellow blogger but what to doooo I need to focus on my other priority wait list. I've just registered for my degree! It has been three weeks and I am still trying to adapt to this new life. I told you guys before that I've applied three courses for Penerapan UiTM and I didn't even put my previous course, Diploma in Accountancy in the options. These are the three choices. My very last minute decision and I'm satisfied. Alhamdulillah, I've been accepted to my first choice. HR! So yea, I am no longer an accountancy student. I am currently a business student! Why I changed my course? Easy. Only Allah knows ☺ Hiks. Well, you know life is tough when you are currently taking course that you don't have passion for? I admit that during my school days I was very interested into accounting. I was one of the best students for Prinsip Perakaunan and everyone thought that I'm going to do well in that area someday. But predictions aren't always right everybody. I lost my passion towards accountancy since my early semesters during diploma. Struggling to the end of diploma with good pointer but without passion ain't easy. But still, alhamdulillah, I made it. Thank you Allah, mama abah, everyone. New course, new campus, new friends, but not new environment. Haha. 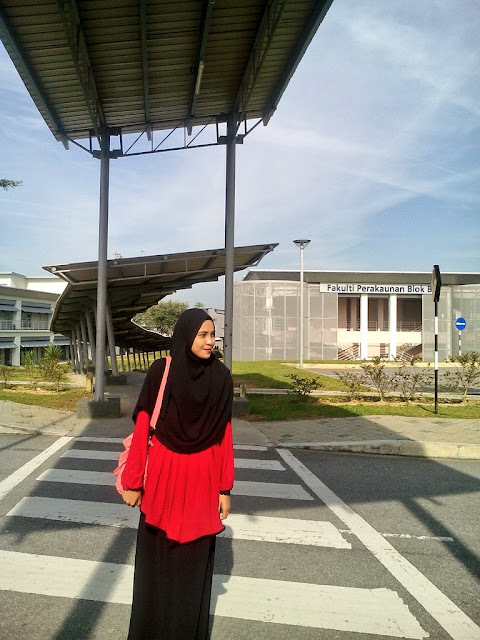 I'm currently studying in UiTM Cawangan Perlis Kampus Arau. Less than 5 km from my house! Wowww so now everybody should know why my parents actually wanted me to apply HR. They knew it. Haha. This campus offer Degree in HR, Finance and Marketing under Faculty of Business Management. So yea, mamabah. Your daughter will always be here. Both of you don't have to worry so much. Abah won't need to drive for hours anymore. Oh by the way, although my house is just 5 km away but I still stay in the college. To future degree students who are going to enter UiTM Arau, don't worry too much. It is stated in the offer letter that "kemudahan kolej tidak disediakan" but on the registration day, all of you will be directed to college right away. There's so many empty rooms here. I actually prefer to study in another state. I love exploring new culture and meeting new people. But now I don't mind. I'm glad that I made both of my parents feel less burdened. haha betul pelajar uitm je yg faham kes ni, dalam offer letter cakap tak disediakan kolej pastu terus gelabah nak cari rumah sewa tapi bila pergi register dapat je kolej. kesian member yg dah cari rumah tu..
ohh myy...tahniah kirim salam uitm Arau dari uitm puncak perdana!